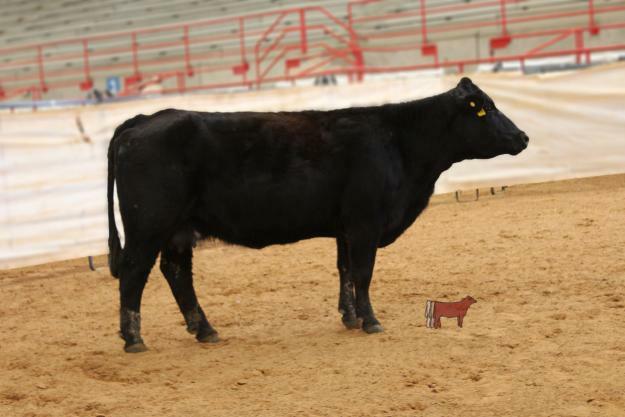 Solid Black cow purchased at the Gold Bullion sale in Kansas as a young heifer with an empecable pedigree. Brooks Above Par as the Sire and the infamous KSU Miss Too Black 103N, Top Donor, that has been the foundation of many of the Gold Bullion Group sales, along with her Dam the Miss Kansas K 11G cow, WOW! Safe in calf to our solid black, HSF Big Sky 59S 90W herdsire, purchased for the Hoffmans in Kansas. He is the full brother to the Wilkinsons Ranch top Donor, HSF Miss Sky 87U in North Dakota. For more information call 903-450-6236. Consigned by Bois D' Arc Land & Cattle.